Planted tomatoes. They look nice and ripe on the outside and when we cut them, they are green and hard down the 'core'. What could be wrong? It has been extremely hot in our area, above 90 for days in a row for over a month with barely any rain. We just had some showers this week but nothing much to speak of. It actually may be too hot for the tomatoes to ripen. 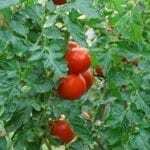 Once temps get above 90 F, most tomatoes will stop the ripening process. Once things cool down a bit to about the mid 80s, the tomatoes will come very fast. In the meantime, you can pick a few that have started to turn red and place them in a paper bag in the house. 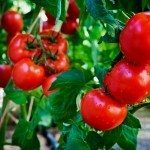 They will ripen and taste almost as good as the ones that ripened in the garden.